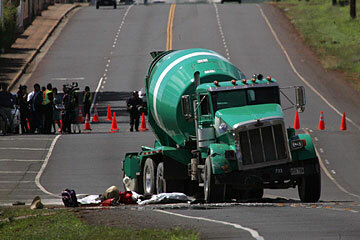 The scene of the fatal April 24 Kunia accident is shown here. The man suspected of causing a traffic accident on Kunia Road that killed four women turned himself in to police yesterday, 10 days after the deadly crash. The 46-year-old Kapolei man is suspected of trying to illegally overtake other vehicles on Kunia Road. He was questioned by police on the day of the April 24 accident and denied being at the scene, police said. He was arrested yesterday on suspicion of five counts of failure to render aid in an accident involving death or serious bodily injury and three counts of failure to render aid in an accident involving substantial injury. Both are Class C felonies*, each punishable by up to five years in prison and $10,000 in fines. He has not been charged. Some family members of the four women say the arrest could help them heal. "We are relieved that the man who caused all this tragedy turned himself in," said Arsenio Sacalamitao, whose sister Ana, 46, was among the four. "I know that we cannot bring back the life of my sister." The Kapolei man is the suspected driver of a sedan that was attempting to overtake a vehicle in a line of cars heading toward Wahiawa on a two-lane section of Kunia Road near the Royal Kunia subdivision. A pickup truck heading in the opposite direction swerved left to avoid the car and into the path of a Wahiawa-bound concrete mixer truck. The pickup was filled with workers headed to Ewa to harvest tomatoes. Eight of them were injured in the accident, two critically and one seriously. Sacalamitao, Aquilina Polendey, Gertrudis Montano and Lorna Laroco were killed. The man came with his attorney and turned himself in at the main station at 11 a.m. yesterday and he was arrested 15 minutes later. Police Capt. Frank Fujii said the suspect, who has no prior convictions, was released pending investigation. Since the driver was not directly involved in the accident, he was not arrested for fleeing the scene. Fujii said the investigation is far from complete, and it will take a while to develop the case. Police had asked the man to come forward several times, he said. Fujii did not know whether more witnesses had put the man at the scene or whether he answered any further questions yesterday. "In order for us to arrest anybody, we need probable cause," Fujii said. When she heard about the arrest, Annie Cruz, niece of Polendey, said, "Thank God. We're very happy because at least there's justice. "If he admit that he did that, we're really happy that he came forward," she said. "That's what we are waiting for." Polendey's husband, Ricardo, and other family members have flown to the Philippines to bury her in Manila, where four of her five children live. "He wants to bring her home," Cruz said. Ana Sacalamitao's twin sister, Magdalena, was supposed to be with her that day, but she had been transferred to another group. Magdalena says she misses her twin every day and is preparing for her burial in the Philippines. Ana Sacalamitao, a supervisor, normally sat in the passenger seat inside the cab, but for some reason sat in the truck bed that day, her brother Arsenio said. "That morning, she chose to ride in the back. That is her destiny. All those riders are Ana's friends." » A 46-year-old Kapolei man suspected of causing a crash that killed four women and injured eight other people last month was arrested for suspicion of three counts of failure to render aid in an accident involving substantial injury, a Class C felony punishable by up to five years in prison and a $10,000 fine. A story on Page A1 yesterday incorrectly said the charge was a Class B felony punishable by up to 10 years in prison and a $25,000 fine.